Burn wrote: What's disappointing is that while TRU AU has plenty of competition in terms of toys (Target, K-Mart, Big W, Myer and on a smaller scale, Toyworld), from a Transformers perspective K-Mart and Target have recently raised their prices to match TRU AU, which means they were all mostly on par. Pretty much this. Toys R Us AU, through absolutely no effort of their own, has somehow managed to end up on par with other retailers price-wise since the start of PotP (in the worst possible way, mind you). And since their management of actual stock is a bit better overall, they're kind of the most reliable option for new Transformers right now, unless you want to gamble on figures coming to a local branch of the lower-priced but less reliable Big W.
My nearby TRU doesn't have any Takara stuff, but I have seen it around in other ones. Ranging from Unite Warriors Superion to MP Road Rage and Star Saber, TRU AU can be a really good place to get Transformers! ...Or I guess, will have been a really good place to get Transformers. Before I went to the airport my trip to the Gold Coast on Friday, I ducked into Big W to see what they had (hoping for Wave 2) ... nothing new. Once I got back and left the airport I headed to TRU in the hope they had Wave 2, but at the very least, knowing they'd be the place to help me get POTP Rodimus Prime, and I knew they had 20% off that weekend. And as expected, they helped me secure Rodimus Prime (with 20% off), no wave 2 but that's not surprising as they've been located more often at K-Mart. As someone who lives in a regional area and can often wait four weeks or more before figures reach me (after being spotted in metropolitan areas), I could always rely on TRU to have stock, sure, they were always more expensive, but at least they could be relied upon and they had more sales than the major departments stores. At the very least, TRU has recently been where I secure every new non-Deluxe figure, since the prices are basically the same across the board for all other size classes. I've only been metropolitan myself since February this year, but even just in those three months, of the seven Transformers I've bought over half have been from TRU. Battleslash boys? Only place I've ever seen 'em. Jazz and Dreadwing? There was a sale a while ago and they were $30, not ideal but still on par with the cheapest other stores. I'm planning to go out and look for Wave 2 in the next couple days, but honestly I'm probably only going to check TRU. Hopefully, an emergency sale for TRU AU does end up happening, and the company doesn't collapse entirely. But if worst comes to worst, maybe it'll mean I can pick up some Studio Series at one of the famous Australian "Everything must go! Up to 20% off!" discounts. TOYS“R”US CANADA-WE ARE OFFICIALLY HERE TO PLAY AND HERE TO STAY! Toys"R"Us (Canada) Ltd. announces the completion of the acquisition of its business by Fairfax Financial Holdings Limited. Toys R Us Canada is now a proudly Canadian-owned and operated business employing more than 4,000 Canadians and Canada’s only exclusive coast to coast business with over 80 locations dedicated to kids and babies across Canada. Over the next few months, we will roll out exciting new innovations that have proven successful at our Langley, British Columbia and our South Barrie, Ontario stores including dedicated play areas, interactive stations for kids and mobile pay. Beginning this month, we are delighted to host 10 Starlight Dashes across Canada in which seriously ill children from the Starlight Children’s Foundation will have three minutes to race around the store and fill their carts with toys. This summer, we will be moving full steam ahead across Canadian communities with the message that we’re here to play, here to stay! At Toys“R”Us we believe that moments of joy, endless possibilities of fun and the wonder of imagination all happen through play. We will be challenging kids, parents, grand-givers and kids at heart to embrace the power of play. Look for play events at your local store. All customer programs like Baby Registry, “R”Club™ loyalty and wish list are running just as customers know and love. Gift cards purchased in Canada can be redeemed anytime online and in any store location across the country. Thank you for choosing to shop at Toys“R”Us Canada and Babies“R”Us Canada! We are excited about our future and look forward to inviting you back to see what’s new with us. Visit www.toysrus.ca and www.babiesrus.ca for exciting announcements and new events happening throughout the summer. Lucky you seriously though at least it's nice to hear good things associated with the name now. Toysrus Canada is 100% Canadian, but there is still toysrus elsewhere in the world. What I find ery bizarre is that I recieved this e-mail from toysrus last month. william-james88 wrote: Toysrus Canada is 100% Canadian, but there is still toysrus elsewhere in the world. What I find ery bizarre is that I recieved this e-mail from toysrus last month. Not the same email, same subject line. The one a month ago was announcing the purchase, the one today was stating it went through successfully. That's why it's the END of the Canadian saga. As for the rest of the world, "to be continued" I guess. We knew that Fairfax Financial had won the bidding for Toysrus Canada and now all the documents have been signed and Toysrus Canada is now fully owned by Fairfax. The later being a Canadian company means that Toysrus Canada is now 100% Canadian with no ties to the US, which is quite a twist since it started as a subsidiary of what was once a prominent American business. 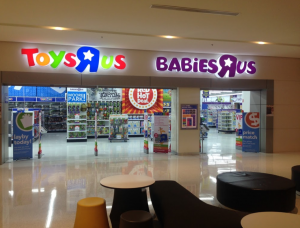 Now, simply due to the fact that competition was limited in Canada for toys of any kind (with a tough barrier of entry for any potential competition due to Canada's ridiculously low population density), Toysrus Canada has always been profitable. But all along, its earnings were going to the US parent so there was no chance for reinvesting in the Canadian business. But that is over now, so we can simply imagine how this company which was already great will now have an influx of cash for reinvesting and improving. Toysrus Canada aims to reinforce the fact that they are sticking around and to do so, they are offering events every week-end in June with free 5$ giftcards to anyone who shows up, along with free gifts like lego kits you can build in the store and take home with you. Plus, if kids bring in their report card on the last Saturday of June, they get a gift. These are all shown in the image below and more details can be found here. TORONTO (June 1, 2018) – Toys "R" Us (Canada) Ltd. announces the completion of the previously announced acquisition of its business by Fairfax Financial Holdings Limited. As a result of the acquisition, Toys R Us Canada is now a proudly Canadian-owned and operated business employing more than 4,000 Canadians and Canada’s only exclusive coast to coast business with over 80 locations dedicated to kids and babies across Canada. This summer, Toys “R” Us will be moving full steam ahead in getting the message to Canadians that we’re here to play, here to stay! “We will be challenging kids, parents, grand-givers and kids at heart to embrace the power of play. At Toys “R” Us, we believe that moments of joy, endless possibilities of fun and the wonder of imagination all happen through play,” said Teed-Murch. The company also remains committed to its philanthropic initiatives and its support of communities across Canada. Each year, the company raises nearly $2 million to support its partners through the generous support of its customers and team members. Beginning this month, Toys “R” Us will host 10 Starlight Dashes across Canada in which seriously ill children from the Starlight Children’s Foundation will have three minutes to race around the store and fill their carts with toys. All customer programs like Baby Registry, “R”Club™ loyalty and wish list are running just as customers know and love. Gift cards purchased in Canada can be redeemed anytime online and in any store location across the country. In the coming months, the company will roll out exciting new innovations that have proven successful at recently opened stores in Langley, British Columbia and Barrie, Ontario. This format includes dedicated play areas, interactive stations for kids and mobile pay. The evolving omnichannel strategy connects customers wherever, whenever and however they want through our webstore, mobile and store shopping experience. Visit www.toysrus.ca and www.babiesrus.ca for exciting announcements and new events happening throughout the summer. Well it's good to see some light at the end of the tunnel. I'll miss my UK stores, but I wish all the best for Toys R Us Canada and hope they continue to do well.